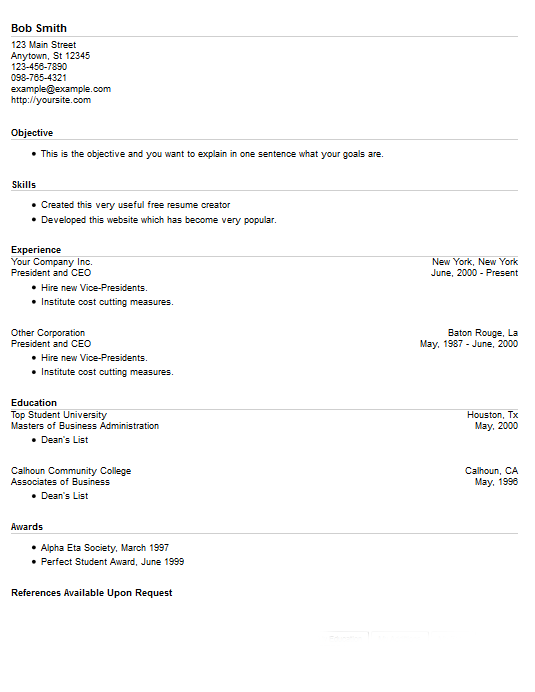 Our most popular resume template, this is a good template to use if you need space for a lot of jobs or a lot of education. Compared to some of our other designs it has a more spacious feel to it because the elements have more distance between them. This standard, general purpose template is a common design that should suit most job seekers' requirements. That is probably the reason most users pick this style. The top area contains the name, which is bold and in a larger font than the rest of the text. The top area also contains the contact points of the applicant, including the street address, email address, two telephone numbers and social media address. There is a horizontal rule under the name which allows it to stand apart for greater prominence. Each section also has a matching horizontal rule under each heading to provide a means to tastefully separate each section. Like all of our templates the attributes and layout of each section can be easily modified by the user. The lines of information in the sections are in a stacked arrangement, this improves the chance that the details presented can be seen without much effort with the potential that the Human Resources executive will actually read what you wrote. The headings and school and company names are aligned to the left. The degrees and job titles are placed below the school and company names. The cities and dates are aligned to the right. The individual details of each school and job and found below the job titles and degrees depending upon which section you are viewing. An "Additions" section allows the user to enter whatever details they wish and name the heading of this section whatever is desired. The common phrase "References Available Upon Request" can be placed at the bottom if you so choose. To use this template visit our Free Resume Creator the ability to update and modify the template is facilitated by using our free program.